Born to a Jewish family in Estonia in 1901 and brought to America in 1906, the architect Louis Kahn grew up in poverty in Philadelphia; by the time of his death in 1974, he was widely recognised as one of the greatest architects of his era. Yet this enormous reputation was based on only a handful of masterpieces, all built during the last fifteen years of his life. 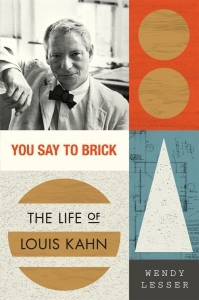 Perfectly complementing Nathaniel Kahn’s award-winning documentary, My Architect, Wendy Lesser’s You Say to Brick is a major exploration of the architect’s life and work. Kahn, perhaps more than any other twentieth-century American architect, was a “public” architect. Eschewing the usual corporate skyscrapers, hotels, and condominiums, he focused on medical and educational research facilities, government centers, museums, libraries, parks, religious buildings, and other structures that would serve the public good. Yet this warm, captivating person, beloved by students and admired by colleagues, was also a secretive and mysterious character hiding behind a series of masks. Drawing on extensive original research; lengthy interviews with his children, his colleagues, and his students; and travel to the far-flung sites of his career-defining buildings, Lesser has written a landmark biography of this elusive man, which reveals the mind behind some of the twentieth century's most celebrated architecture. The first biography of the iconic American architect that delves fully into his life and work.